Hi, I was inspired to make this card by the challenge at Flutter by Wednesdays, to use Autumn colours and a butterfly or fairy on your project. I die cut Memory Box Isabella butterfly as my base out of black card. I had distressed some water color paper for another project and used some of the leftovers to cut my top butterfly from the Pippi die. I also cut a top from black and glued the pieces back into the wings, fiddly but I like how it looks. Since I used snippets I'm going to visit the playground at Pixie's Crafty Workshop. Simon Says Stamp Wednesday Challenge has an emboss it challenge. I used the tiny bubbles embossing folder as a background for my butterflies. Seize the Birthday has an Anything Goes challenge as long as it's a birthday theme. You can also add a topping to your project if you want to. Make it Monday is also anything goes and to share creativity. Hi Cathy - lovely your card! The fall colored butterflies are so perfect on that embossed background! Very pretty! Love the dimensional butterflies. Beautiful card and fabulous butterflies! Popped over from MIM! More beautiful butterflies! I think this card has an Asian feel! Very nice! Love the black bodies. I'm going to have to remember that! This is so pretty!! Thank you for playing along with my Flutter By Wednesday Challenge! A fabulous card Cathy, I love your design and colours. Your butterflies are stunning on the white embossed background!!! Absolutely beautiful Cathy! Love how you did the butterflies - I've been staring at them and got confused - did you cut a black one with the solid die, then the lacy one in the lighter colour and then another lacy one in black so you could fill in all of the spaces by using both black and the lighter colour? In other words, the top layer is flat when you run your finger over it - with a mix of black and lighter colour infills? Sheesh, you sure have some patience but the result is gorgeous! I love your beautiful butterflies and the wonderful sentiment. Thanks for joining us at Flutter By Wednesdays this week! Very pretty card and those butterflies are fabulous! Thanks so much for joining us at Seize the Birthday! Butterflies, I love them and the sentiment is a wonderful touch to this beauty. Very nice card.... Happy Crafting young lady! I just love your butterflies Cathy,gorgeous colours and fabulous card design..
Lovely card-beautiful butterflies-and I do LOVE butterflies! 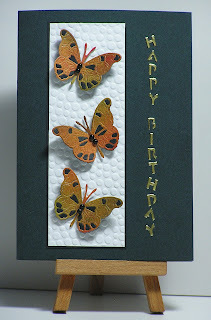 Love the embossing and the beautiful color of those butterflies! So lovely and a perfect design. Great use of snippets...those butterflies are beautiful. LOVE this great snippets card. I love those colored snippets on the butterflies, and the embossed background looks so nice! I'm a big fan of vertical sentiments like this too - great card! This is so very pretty. I really like how you did those butterflies and your gold sentiment. Love those fluttering butterflies. :) Thanks for joining us at Make It Monday.